I am praying right now for physical healing (a supernatural gift from God) for a number of people who are struggling, and God may provide that healing through “natural” means (like medicine or surgery). I am working right now on my sermon for Sunday. I need supernatural illumination of His Word to make sense of it, but God often provides this insight after the natural process of study and preparation. I want those around me to know how much I love and care for them with supernatural depth, but the way God works that out often is through the natural process of affirming words and good deeds over time. See what I mean? Certainly God DOES supernatural things, but often the way He does them is through natural means. Peter (who himself wrote two of the letters included in our New Testament) says in 2 Peter 1:20-21, “knowing this first of all, that no prophecy of Scripture comes from someone’s own interpretation. For no prophecy was ever produced by the will of man, but men spoke from God as they were carried along by the Holy Spirit.” In this verse, Peter highlights the supernatural origin of God’s Word. So, God supernaturally moved the writers of Scripture along to write His Word to His people, but the process by which the Scripture was written sometimes looked very natural — like when Luke researched and compiled the eyewitness accounts of Jesus’ disciples in writing his Gospel. But who did Luke talk to? And when did he talk to them? At this point, we are dealing with some conjecture, but conjecture educated by historical facts. Luke’s Gospel dates to the late 50’s AD, about 25 years after Jesus’ crucifixion, resurrection, and ascension. Many scholars believe Luke (a traveling companion to Paul) probably got a lot of his “eyewitness accounts” during Paul’s imprisonment in Caesarea from 57-59. During these years, Luke (a Gentile who joined Paul’s ministry as he headed to the European continent) found himself in Israel (possibly for the first time) and interacting with many of the original Apostles . . . and Mary – the mother of Jesus. In all these accounts, Mary opened up the vault of her soul, and probably shared with Luke what she had treasured about the birth of her firstborn son, who was the Firstborn of all creation! (Luke 2:19) In turn, Luke wrote these treasures down and through that natural process, the supernatural revelation of God was preserved for you and me. 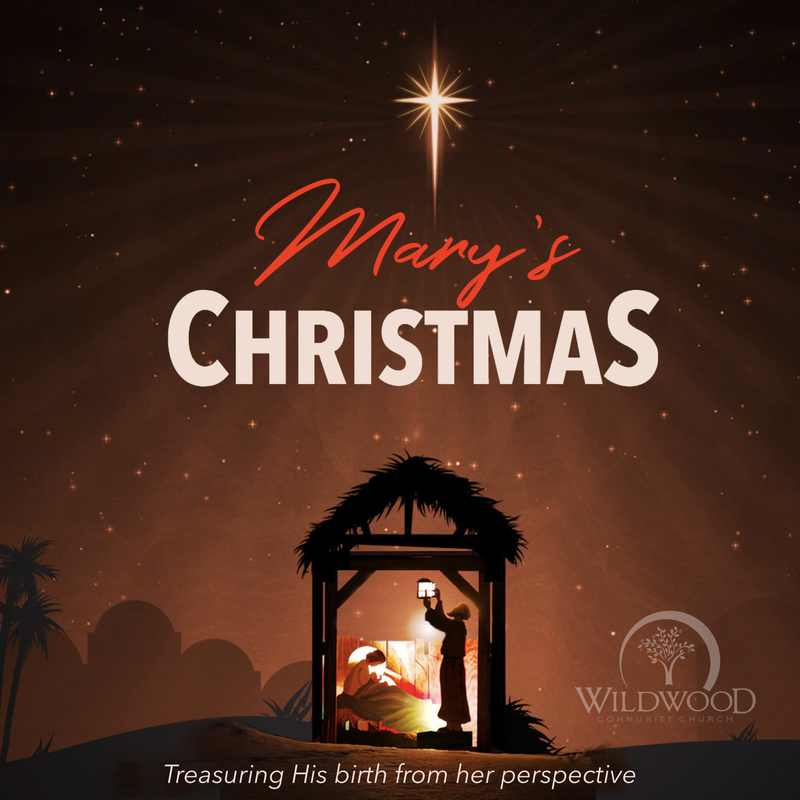 This Christmas season at Wildwood Community Church in our worship services, we will be walking through a series of messages (beginning this Sunday, December 3) titled “Mary’s Christmas: Treasuring His birth from her perspective.” We would love to have you join us! This weekend, we will be kicking off this series by looking at the Angel’s declaration to Mary that (though a virgin) she would be pregnant with God’s Son. The Angel’s message was simple, “Mary, the time for God’s salvation is NOW, and YOU are the means by which that salvation will be valeted into the world!” Mary had to be excited and scared to death with this announcement. More than 2,000 years later, I think God has a message for us today that is both exciting and scary. What is that message? How does it connect with what Mary treasured 2,000 years ago? Use the natural process of coming to Wildwood Sunday morning in our 8:30, 9:45, or 11:00 service to find out what the supernatural message of God is from Luke 1:26-38. Hope to see you there! FREE CHRISTMAS DEVOTIONAL: I wrote a 25 day devotional guide. Download all 25 days of the devotional in pdf or ebook format (for free) by clicking here. I like the part that says God often does supernatural things through natural means. The analogies are very apt and I am blessed.